I consider myself one of the luckiest people in the United States because I live and work in the only US city (to date) that has Leon. This British fast food chain wowed me last year with their American debut and impressively delivered gluten-free friendly fare that was not only healthy, but absolutely delicious. 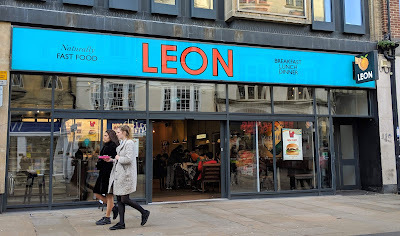 As I was planning my recent UK trip, I knew for certain that stopping by one of Leon's many locations in London was a must, both as a comparison to their stateside shop as well as to try their highly-regarded gluten-free chicken nuggets, a menu item that has not made it across the pond (yet). 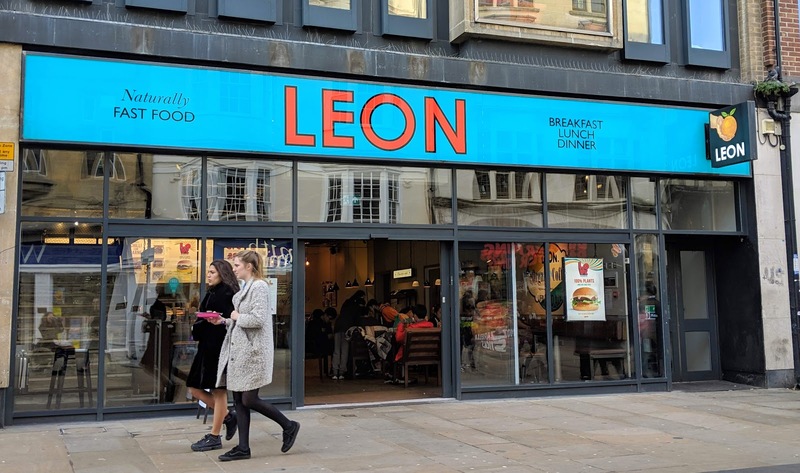 As it happened, I was able to stop by Leon twice while overseas: I had lunch at their Oxford location and breakfast at Heathrow Airport before jet setting back to the States. As with most restaurants, Leon is not dedicated gluten-free, and food is prepared in a shared kitchen, but they do have processes in place to reduce the risk of cross contamination and have clear information about ingredients in every item if you have questions. Upon ordering at both locations in this post, I was asked if I had any dietary restrictions, and confirmed that I was gluten and dairy-free. Their staff were eager to help me identify options and I also appreciated the clear menu labeling. I visited Oxford as a day trip to get out of the hustle and bustle of the city. After spending the morning taking in the swoon-worthy scenery of Oxford University and the surrounding town, I stopped by Leon for a hearty lunch, wanting to fuel up before an afternoon tour and train journey back to the city. 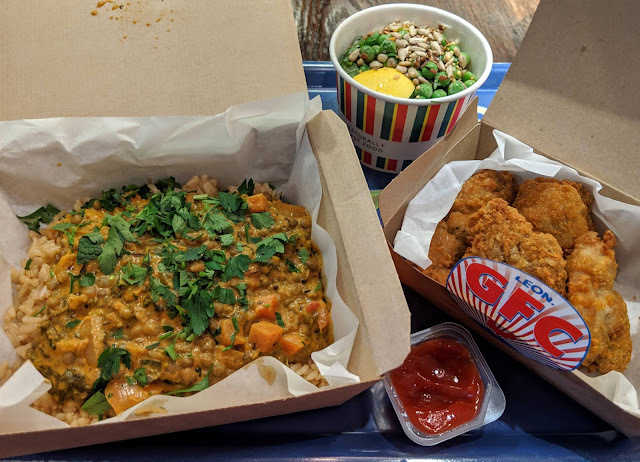 I ordered the lentil masala box (which was also vegan), the gluten-free chicken nuggets, and the crushed pea salad. The lentil masala was hearty, featuring richly-spiced curried lentils over fluffy brown rice. I also enjoyed the chunky carrots and onions that were stewed with the lentils. This dish definitely proved that plant-based can be both protein-filled and filling, especially on a winter's day (albeit a mild one). The crushed pea salad featured sweet peas, a variety of seeds, a light dressing, and a lemon slice for adding a dash of tart lemon juice to the mix. While I enjoyed the contrast of textures and flavors of the pea salad, I think I definitely prefer the kale slaw served at their DC location as a veggie-based side. Don't get me wrong- it was good, but was overshadowed by it's American counterpart. And now for the main event: Leon's gluten-free chicken nuggets! 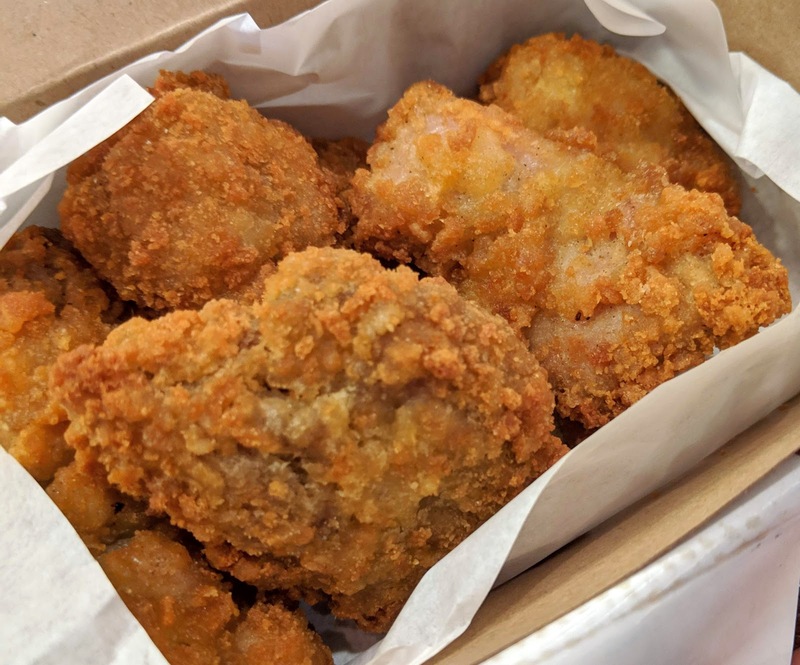 These definitely look and smell like the nuggets served by a certain chicken chain here in the States, but I'd argue these nuggets are a notch above because they're made with real, clean ingredients. The satisfyingly crunchy exterior (made with rice, maize and gram flours) gives way to tender, deliciously juicy chicken thigh pieces. Seasoned perfectly with simply salt and pepper, I almost cried as I enjoyed every taste and texture. I can't remember the last time I had a proper, fast food style chicken nugget, and Leon's were well worth the wait. The nuggets come with your choice of garlic aioli, chili, or Korean mayo as a side sauce, but I opted to go with a classic pairing of tomato ketchup. So simple, yet such a rare experience to be able to enjoy chicken nuggets when dining out! Hopefully someday they too will cross the pond; I for one will eagerly welcome that British invasion! Arriving well before my flight time (but not wanting to chance it with traffic), I was relieved I could hang out at Leon's Terminal 2 location for a leisurely breakfast before spending the next seven and a half hours in a big metal bird. 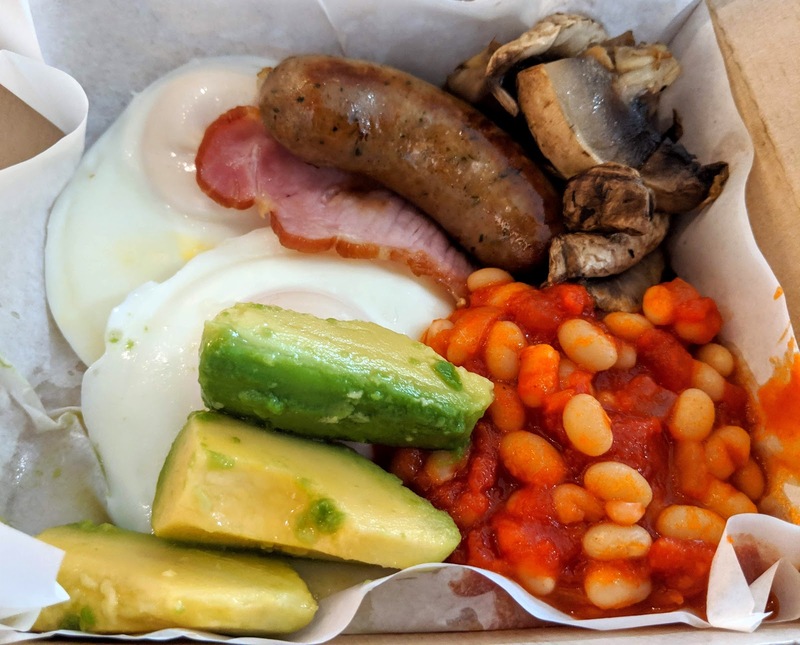 I ordered the naturally dairy-free full English breakfast box, which contains poached eggs, avocado, beans, bacon, sausage, and mushrooms. I enjoyed the perfectly cooked eggs and hearty avocado. The bacon was salty and delicious, though not crispy. Because I am not a huge sausage or mushroom person, I did not sample those components of the box. The surprise hit of the box however was the beans. Other than a handful of breakfast burritos in my pre-gluten days, beans are not a staple to start my day. However, these were cooked with a rich, delicious tomato-based sauce, and I found myself eagerly polishing them off despite being skeptical moments before. As a gluten-free diner, I'm used to skipping breakfast altogether when traveling, because safe options are hard to find at chain restaurants. I really appreciated that Leon had safe boxes and oat porridges available, which really cater to this underserved group. I was glad I could get on my plane with a full stomach and not regret my last meal in the UK. As they did in Washington DC, Leon proved once again that fast food and healthy food can and should coexist. Whether at home or abroad it's so amazing to be able to walk into any location of the chain and find safe options of the highest quality and an unbeatable price point. Leon really blows the competition away, and with lots of locations in and around London is a great option for travelers and locals alike.